Louvolite Vision Duo-fabric roller blinds offer a stunning alternative to both conventional roller blinds, voile and curtains, by combining all elements within one product. The unique double layer of fabric, with horizontal strips of alternating fabric and sheer, can be rotated into the open position where the sheer fabrics match up allowing light to penetrate into your room. To block out light, and return to the privacy position, just manoeuvre the blind so that the fabric strips overlap. Vision is an innovative new window blind that features two layers of translucent and opaque horizontal striped fabric. The front layer moves independently of the back allowing the stripes to glide between each other creating an open and closed effect, with limitless light control. Sliding the fabric into a closed ‘opaque-opaque’ position allows full privacy and an impressive block of beautiful fabric at your window, whilst the ‘translucent-opaque’ position creates a stunning striped statement. Vision blinds not only look great but are practical too, enabling you to soften excess daylight and reduce the glare entering your room. Easy to use, a single control is used to slide the opaque and translucent woven stripes past each other. The same operation is used to raise or lower the window blind to any height in the window with ease, in the same way the classic roller blind would. A Vision blind will also roll up fully into the attractive cassette headrail to reveal an uninterrupted view to the outside. 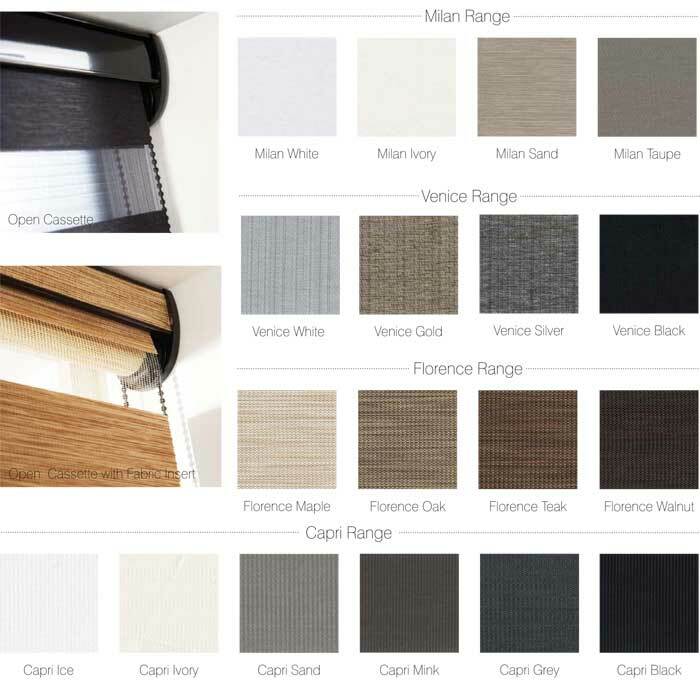 The ranges feature beautiful metallic finishes, pretty sheer fabrics, natural wood woven effects and a fashionable selection of muted tones. Combined with a number of cassette headrail options, Vision blinds are sure to complement any interior design scheme.